No matter how early we get up, school mornings always seem to end up rushed for us. They start out relaxed and slow (there’s no other way for me! ), but as the clock ticks forward, the stress levels increase drastically. At the end, there’s always that moment where everybody is running around like a headless chicken. I’m brushing and braiding hair at the last minute, while quickly spot-cleaning the faces I see in front of me. The kids are running up and down the stairs looking for their gym clothes, or are frantically trying to tie their shoelaces (that is, if they are even able to find a matching pair of shoes in the shoe basket). I get annoyed, voices are raised, the chaos is complete. Until… a (clearly very clever!) friend of mine gave me the golden tip yesterday. She told me about their brilliant system: at 8AM their Sonos music system automatically starts playing a song. When that happens, all family members know it’s drill time: they have exactly 3 minutes (or however long the song lasts) to make sure they are ready in the hallway, coats on, shoes on, school and gym bags ready, etc. How clever (and fun!) is that? I can just imagine their family, dancing and singing and happily getting ready in the morning, laughing while making sure to be ready before the song ends! My friend also told me, that all family members get to choose their favourite song one day of the week. Apparently it is possible to program specific music at specific times in the Sonos system, so for instance on Monday at 8AM dad’s song of choice sounds through the house, on Tuesday it’s the daughter’s favourite song, etc. So fun! PS As always, I’m happy to hear any tips or tricks that might help making our mornings more relaxed! PPS Before you think otherwise — this photo was taken on a weekend morning. A totally different vibe altogether! What a good idea! Getting a young child out of the house in the morning is very difficult to do without making everyone stressed. I am going to try the three-minute-song this week! I actually do music in the morning to get out of bed. There is nothing like a good beat to get kids motivated to jump out of bed and start the day! This sounds really nice! Please tell us how it went for you. Maybe I’ll try this here as well. Anything for stress-free mornings! LOVE THIS IDEA !! !…definitely going to try it…. After a very frantic and fraught morning trying to get 2 kids out of the house, I AM going to try this!! Great idea!!! I will try it!!! arghhhhh!!!!! Absolutely love this!!!!!!! I’ll choose acdc to really get them going. (Can you imagine choosing something gentle and sweet and just meandering to the shoes!!!!!) hilarious idea thanks!!!! Genius! Now I also have a good reason to buy a radio as well! 😉 Two flies with one stone! We do this! My husband has a little alarm that goes off on his phone when it’s time to walk out the door. It’s a little tune that’s come to mean “Time to Scoot!”. Very helpful. A song would be fun to implement as well! I love it. Such a brilliant idea of making a tiring stressful part of the morning into a fun game..
Great tip! We have a Sonos, so I will give it a try! My oldest (of 3) is just four, so most of the things I have to do. My it’s a good sign to get the jackets and the backpack! We don’t have a rush in the end. I try to be downstairs at 7.30 and then it will be fine. And I prepare everything the evening before. Their clothes are picked and the table is ready! And the lunchbox is ready to be filled. What a great (and fun!) idea! It’s like the Mary Poppins way of parenting – making it fun so they forget about the work and just get on with it. Thank you so much for this post, Esther (& your dear friend for the tip)! I’ll give it a try, since my daughter is starting school next week, so we have to leave on time (which we were definitely not during kindergarten). Starting form now I might have to laugh every morning because of your “headless chickens“ – that’s exactly what is happening in our house too!! Cute idea. By the way, where are those egg cups from? They’re adorable! I also use my iPhone alarm that goes off at 8 a.m., and that’s when everyone knows it’s drill time. Most mornings are still an utter chaos. I love this idea, and am definitely going to try it. Thanks for sharing! Also, like Kiana, where are those egg cups from? I love them! Glad you admitted the picture is taken on a weekend-morning! That’s why I love your blog! Hahahaha weekend foto! Heerlijk. Wij moeten sinds de verhuis op de fiets naar school en staan ruim op tijd op. Klinkt vreselijk maar wat een pak minder geschreeuw en gestress. Iedereen kan even uitbrakken met een kommetje muesli. I love this idea!! Nathan makes breakfast and has a special whistle that he calls the “breakfast bird” when it’s ready. The kids drop everything and run to the kitchen, so I bet this would work brilliantly! This is what I do in my classroom at ‘pack, stack, and clean’ time. When my students hear the magic song of the term, they automatically stop what they are doing and start cleaning the room and packing for the end of the day. It’s amazing what can be done in three minutes when they set their mind to it and when a little dancing is involved! A trick of the trade… I always have a ‘magic job’ or ‘magic piece of rubbish’ and whoever does that job or cleans up the rubbish gets to choose the end of the day game, the next song or any small easy free reward! 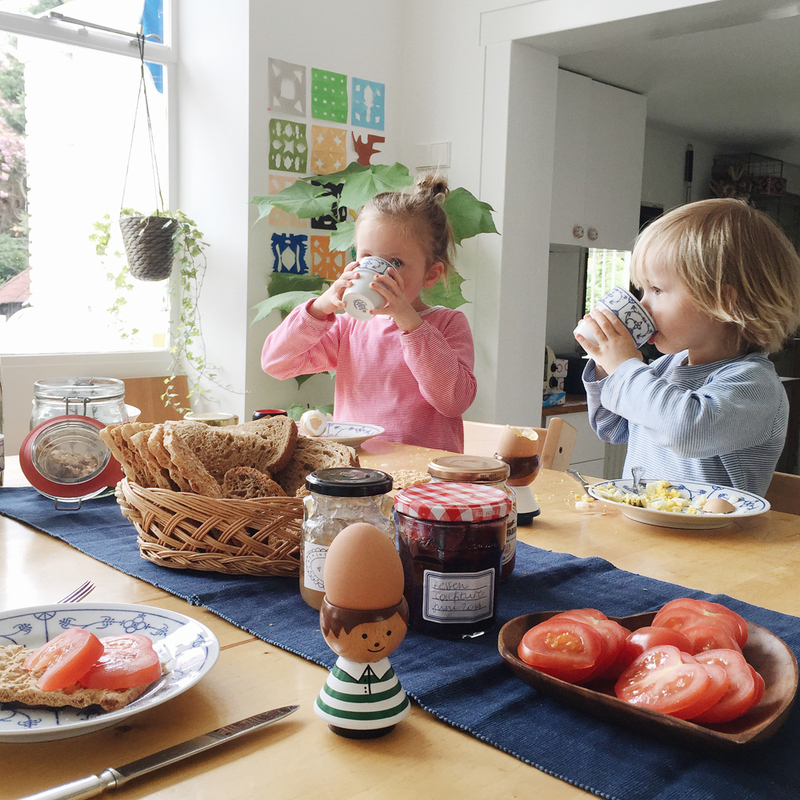 I’ll try anything that might make mornings with three littles go a little more smoothly! Thanks for the tip! This sounds like a great idea! I use a song when getting the children to crèche to pack up their toys – it’s a great audible cue! My kids’ school does this as “hurry up music” before the national anthem and morning announcements. It gives the students time to get their coats off and into the classroom and reminds the dawdlers to get going. The Principal pre-screens the music to be sure that there are no swear words and is suitable for young ears. It’s a nice way to start the school day.